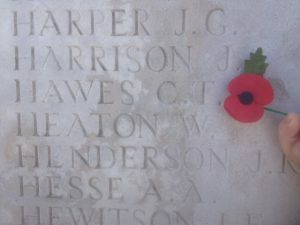 Relatives notified Brother of Mr. G. E. Hawes, of 23. Ashfield Terrace East, Newcastle-on-Tyne. 04.08.1914 1/4th stationed at Hexham, the 1/5th stationed at Walker, Newcastle-on-Tyne and the 1/6th stationed at Northumberland Road, Newcastle-on-Tyne, both part of the Northumberland Brigade of the Northumbrian Division, on Tyne Defences. 1915 The Battle of St Julien, The Battle of Frezenburg Ridge, The Battle of Bellewaarde Ridge. 1916 The Battle of Flers-Courcelette, The Battle of Morval, The Battle of the Transloy Ridges. 1917 The First Battle of the Scarpe, The Capture of Wancourt Ridge, The Second Battle of the Scarpe, The Second Battle of Passchendaele. 1918 The Battle of St Quentin, The Actions at the Somme Crossings, The Battle of Rosieres, The Battle of Estaires, The Battle of Hazebrouck, The Battle of the Aisne. 15.07.1918 Reduced to cadre and moved to defend Lines of Communication in the Dieppe area. 16.08.1918 Transferred to the 118th Brigade of the 39th Division which supervised American Troop training. 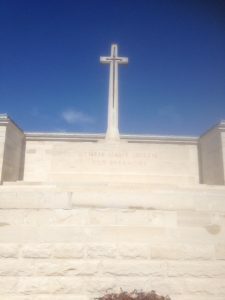 27th March 1918 VAULILLERS Sixth Day of Battle: During the counter attack, large numbers of the enemy were killed and two machine guns captured. Lt. Col ROBINSON and Captain H. ARMSTRONG displayed great courage in leadership before they were shot down. Lt. H.S.S. ALLEN signalling officers was killed. Capt. H.D.K. Davies, 2nd Lt A.V. Davies, 2nd Lt Browning were wounded. Casualties to N.C.O. s and men were unfortunately external heavy in killed. R.S.M. FINCH although wounded in the headed displayed great courage and coolness. The 6th Battalion, Northumberland Fusiliers was most ably supported in the counter attack by a small part of 4th East Yorks under Lt BROWN and Lt ELVIN. Lt. Brown was killed. Arrangements were made by the 8th Division to take over the line and at night the battalion which had become a good deal scattered during the afternoon operation, pendecomplete south of HARBONNIERES under the command of Capt. LEATHART being joined later by Lt. A.V.LEIGH and what remained of the attacking force – some 20 other ranks in all. 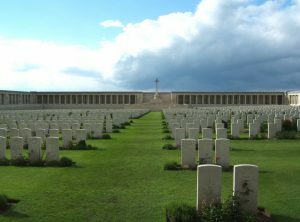 According to Commonwealth War Graves Commission 41 soldiers of the Northumberland Fusiliers were killed on 27th March 1918. 28th March 1918 CAIX Seventh Day of Battle: A general retirement to the line CAIX-WIENCOURT was ordered and commenced at 6 a.m. All troops took up positions in the defensive zone North-East and North of CAEN. East od Cain, French troops were in position. The Balls (The Halls and Balls Light Infantry – 6th Battalion, London Regiment (City of London Rifles) held a long and somewhat scattered line the 7th D.L.I. (Durham Light Infantry) on the left. These positions were held till 4 p.m. when the left flank was down in leaving “A” Coy (CAPOT Leathart0 in an exposed position. The troops effected a safe retreat however and marched through BEAUEOURT and MEZIERES to MOREUIL when the night was spent. According to Commonwealth War Graves Commission 151 soldiers of the Northumberland Fusiliers were killed on 28th March 1918. 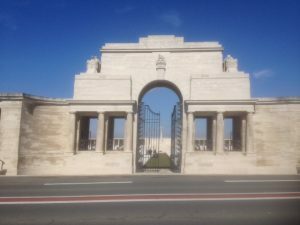 29th March 1919 DEMUIN Eighth Day of Battle. Battalion marched from MORUIL to position due south of DEMUIN and advanced in artillery formation to point 90 on the AMIENS to ROYE road where the enemy was attacking in force / This position was held by the 149 Conf. Bde till darkness set in and a retirement was ordered to the line of the MOREUIL-DEMUIN road. 50th Divisional troops were ordered to rendezvous North West of RIFLE WOOD in support of the new line. 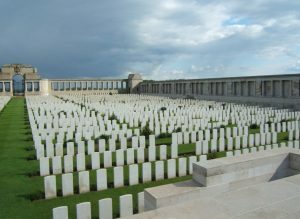 According to Commonwealth War Graves Commission 51 soldiers of the Northumberland Fusiliers were killed on 29th March 1918.